The LOVE 3252 is a luxury sized tub with wheelchair accessibility. Designed for optimal comfort, this model provides ample space for easy maneuverability during bath time. Ensuring the safety of our customers is what motivates us to do what we do. According to the Center for Disease Control, in the past 10 years, ER visits due to falls for older adults has increased by 40%. We know that many of these falls occur in the bathroom due to the prevalence of wet surfaces. 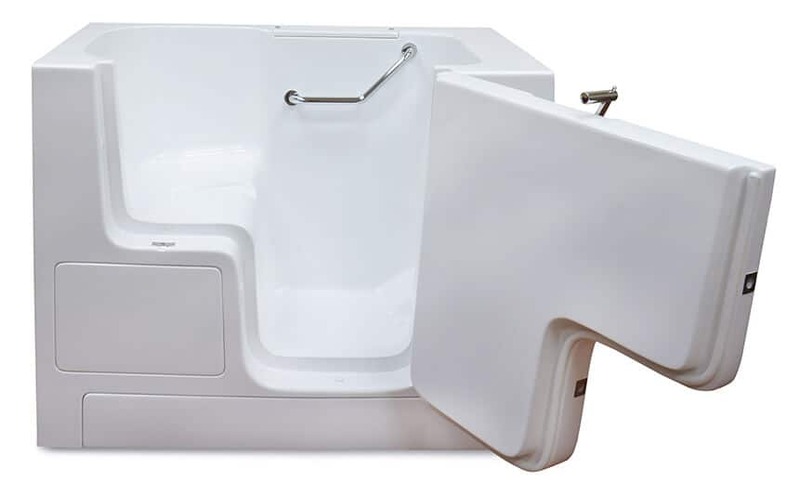 Therefore, like our other wheelchair accessible tubs, the LOVE 3252 is designed with a low, 6″ threshold, and it is manufactured with 6 adjustable levelling legs to ensure that your tub can be adjusted to a height that will allow you to enter and exit your bathtub with confidence and peace of mind. In addition, this model is designed with a water-tight, outswing door that provides users with an easy grip door handle for added assurance. As standard, the LOVE 3252 also comes with a textured non-slip floor, an integrated safety grab bar, and a U-bar for balance. Enjoy your bath time again knowing that your walk-in bath tub was designed with your overall well-being as our main objective. Your comfort and convenience are important to us. The LOVE 3252 measures at 32(W) x 52(L) x 40(H) and 40” deep. With ample room to adjust the water to a level that suits you, this model allows the you to relax, unwind, and let the water envelope you as you sit back and soak the day’s cares away. It comes with a 26″ contoured seat which allows the bather to relax in tranquility. For efficient installation, the LOVE 3252 comes with a wall extension kit to fit in a standard 60″ opening, and we have constructed this model to replace your existing shower stall or bathtub. Furthermore, in order to preserve your existing tile work and allow for quicker installation time, our walk-in tubs are constructed with a flangeless design. We also offer an optional tile flange kit in order to ensure that your walk-in tub remains water tight. We will work with you to make sure that your new walk-in tub is as comfortable and convenient as possible. Along with your safety and convenience, we also make it our mission to supply you with the highest quality materials possible in the construction of your walk-in tub. Therefore, as is the case with each of the other models, the LOVE 3252 is constructed as a one-piece, stainless steel frame, and it is crafted with durable fiberglass made from reinforced material and the highest-grade components on the market today. It also includes a triple-gel coat finish to maintain quality and resilience that will last. This also makes the tub easy to clean, which is a always a desirable incentive. In order to ensure that your tub maintains proper alignment, the LOVE 3252 comes with 6 adjustable levelling legs so that you can adjust your tub to fit your bathroom flooring. In addition, the Love 3252 comes in either white or biscuit, which are colors that can seamlessly match any existing bathroom décor. We offer the LOVE 3252 with a classic and elegant chrome plated faucet set with solid brass construction and an optional Speedyfill 3/4″ fill tub faucet. This is adjustable to the standard 1/2″ faucet, and it allows for faster flow so that your walk-in tub can fill up more quickly, thus allowing you to enjoy a nice, relaxing bath at your earliest convenience. Your hot and cold water taps are complemented with a diverter handle, which allows you to conveniently adjust your water temperature. Your faucet set also contains a hand held shower piece which provides you the liberty of showering as well as bathing. 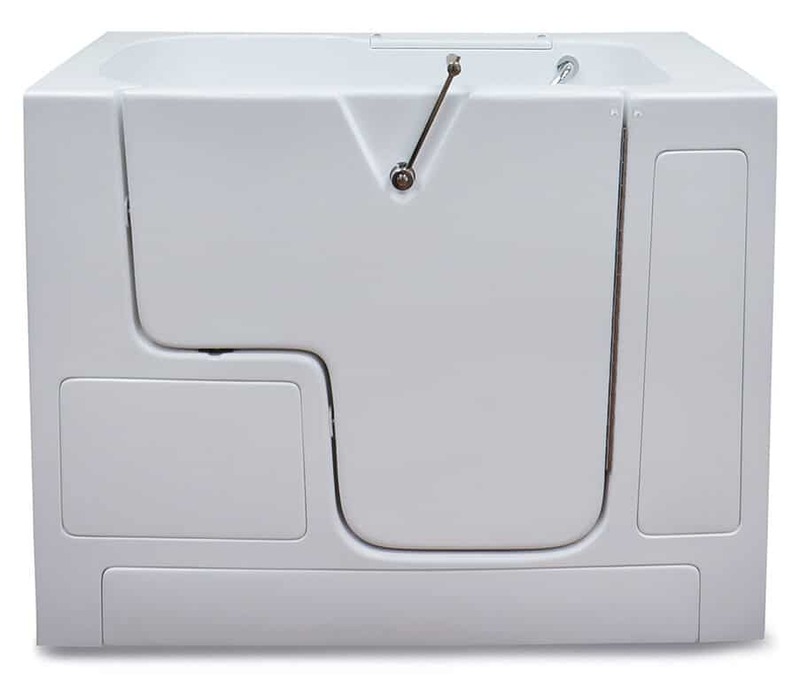 In addition, the LOVE 3252 contains a 26″ wide, contoured seat which is ergonomically nestled inside your walk-in tub. Since this tub has a larger water capacity, many of our customers opt for the 2″ Hurry Drain and the secondary toe drain for times when you need your walk-in tub to drain more quickly. Read below to discover more customizable feature options to personalize and optimize your bathing experience. We understand that everyone is different, so we offer options to cater to your specific needs and wants. Some of our personalized feature options include the Dual Air and Hydro Massage unit which alleviates joint and back pain and promotes circulation. We also offer Chroma and/or Aroma Therapy to promote both mental and physical well being. Different colors and scents have been proven to affect our circadian rhythm and our moods. Chroma therapy uses various colors of light and aroma therapy uses various smells to stimulate the circulatory system, calm pain, and promote peace. You can visit our Features page to view more options. We are happy to offer customizable options to suit our individual customer’s needs. Customize your Love 3252 today, and start enjoying a relaxing and therapeutic experience every time you bathe.